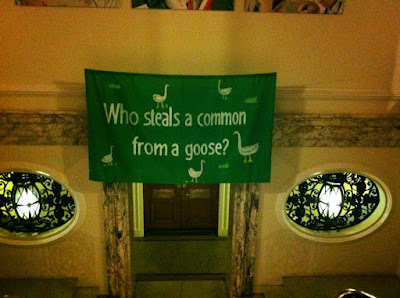 I enjoyed the New Cross Commoners event at Deptford Town Hall last month (14 November) as part of the Being Human Festival. 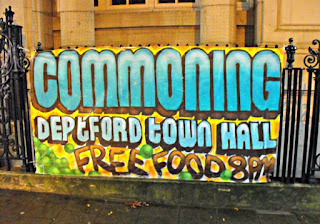 The aim was to host an 'an evening of open reading and discussions on the possibilities of commoning in New Cross, organised around the preparation and eating of food' with 'Bread and spreads... prepared and eaten by community groups, historians, academics and local people to explore the politics of access, place and eating together'. The format was very simple - there was lots of delicious food cooked at the Field in Queens Road, or donated by sympathetic bakers, and people just sat around at tables eating, chatting and taking turns in saying a few words from the front. 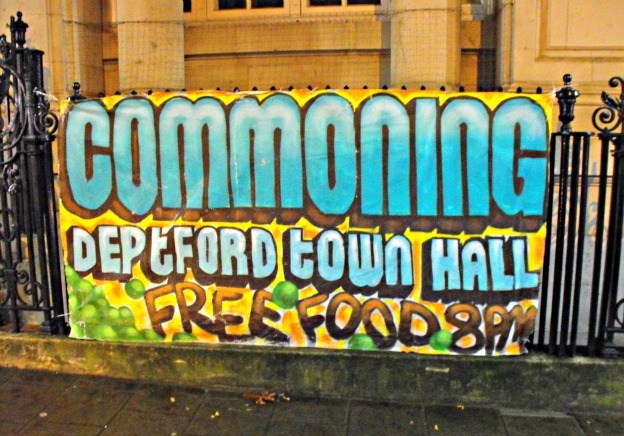 People talked about commoning, plans for a New Cross food co-op, community energy, and about living as local residents in the streets around Goldsmiths. It was the night after the terror attacks in Paris, and a speaker from Kenya (a country no stranger to Islamist terror) pondered on how the simple fact of people from different backgrounds eating and sharing together represented the 'opposite of terror'. - The Metropolitan Borough of Deptford was formed in 1900 - the area having formerly been divided between the old counties of Kent and Surrey (a boundary marker survives on the green at the back of Goldsmiths). - The Town Hall for the new Council was built between 1903 and 1905, and for much of the 20th century was at the centre of local political and social life. The building housed the Council Chamber where the Council met to make decisions, as well as offices where people would have gone to sort out housing and other issues. Many of the great and terrible events of the century echoed through this building. - In the First World War, the Town Hall was used as an enlistment centre. In a one week period in 1915, 750 men joined up there, forming a Deptford Brigade of the Royal Field Artillery that established its HQ at a disused Thames Ironworks site in Blackheath Road. Many of these men never came home from the war. - During the mass unemployment of the 1930s, the Town Hall (then with a Labour Council) welcomed marches of the unemployed. In 1932 two thousand unemployed workers met at Woolwich, and marched with band playing to Deptford Town Hall. The marchers ‘all wearing red rosettes in their caps’ were put up at the Borough Hall, Laurie Grove, being given dinner, a mattress for the night and free use of the public baths. - On 29 November 1944 the Town Hall was damaged in the V2 rocket attack which killed 168 people on the site of the Woolworths store opposite. - As migrants from the Carribean settled in the area from the 1950s they faced racist bans from some local pubs. The Anglo-Carribean Association was established to organise inclusive social evenings and they held events in Deptford Town Hall and elsewhere. 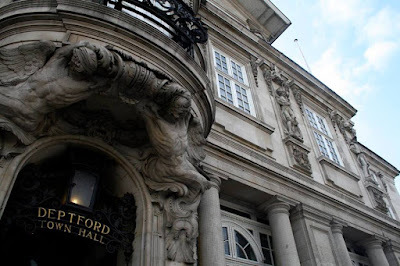 - Deptford Council was merged with Lewisham Council in 1965, so the building was no longer used as the Council HQ although it continued to be used for Lewisham Council offices and for various events. For instance, Lewisham Irish in Britain Representation Group held events there in the 1980s, such as a meeting in October 1987 where Annie Maguire spoke, a couple of years before her nephew Gerry Conlon and the rest of the ‘Guildford Four’ had their convictions quashed. - Alex James from Blur recalls that on his 21st birthday in 1989, when he and other band members were squatting in a semi-derelict flat at 302A New Cross Road, Damon Albarn 'climbed on to the roof of Deptford Town Hall next door and changed the time on the big clock, which stayed at the wrong time for several years' (Bit of a Blur: the Autobiography, 2010). - The Town Hall came under Goldsmiths management from 1998. Of course, its history didn't stop at that point - since then it has hosted many interesting conferences, meetings and cultural events as well as being periodically occupied by students. - In 2007, on the 200th anniversary of the slavery Abolition Act, Paul Hendrich initiated a discussion on the links between Deptford and slavery as embodied in the Town Hall building – statues outside include Francis Drake (who accompanied John Hawkins in 1568 to ‘obtain’ between 400-500 West Africans and sell them in the West Indies), Robert Blake (the head of Cromwell’s navy) and Nelson (who opposed the abolition of slavery). An event at the Town Hall in June 2007 on 'Repairing the Trauma of History: What does an apology of substance look like?' featured a group of people on the Sankofa Reconciliation Walk wearing yokes and chains attempting to make reparation for the acts of the seamen carved in stone on the front of the building. 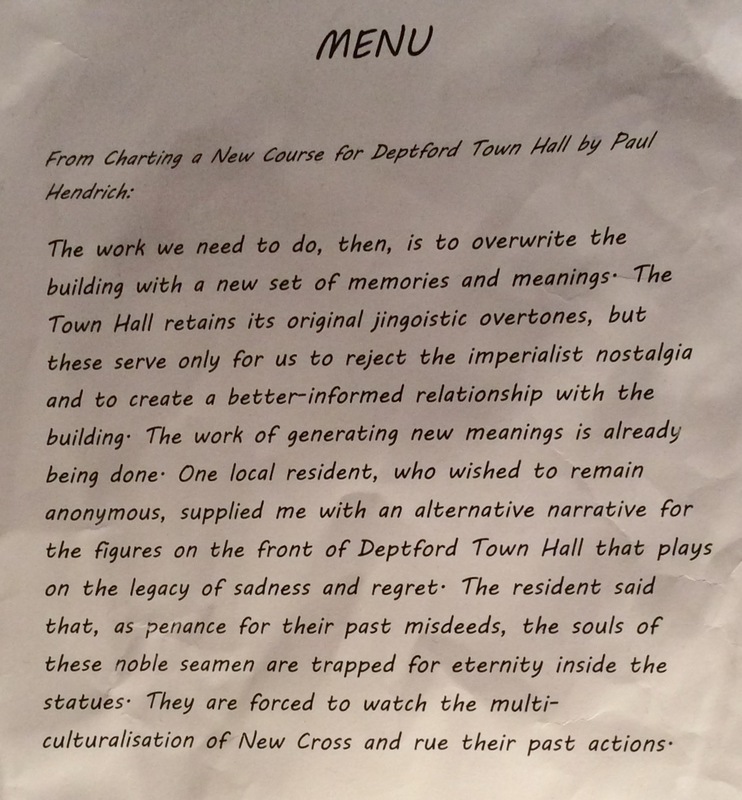 I was pleased to see that on each of the tables at the New Cross Commoners event there was a Menu with a quote from my late friend Paul Hendrich, who wrote about the history of Deptford Town Hall and the relationship of Goldsmiths to New Cross in his article 'Charting a New Course for Deptford Town Hall' (Anthropology Matters, 2008). Today (28 December) would have been Paul's 44th birthday, but sadly he was killed while riding his bike to Goldsmiths in January 2008. 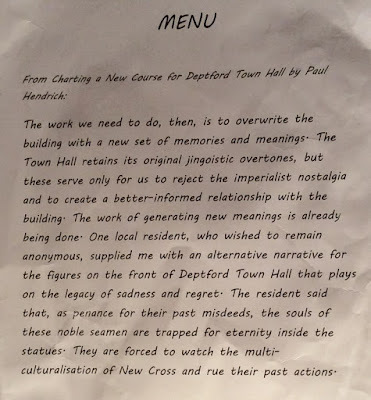 Paul called for us 'to overwrite the building with a new set of memories and meanings' and it felt like the New Cross Commoners were continuing that project. re. The Kent/Surrey boundary post that exists behind Goldsmiths, when I lived on Telegraph Hill (as a youngster in the 1950s and 1960s) there was a county boundary post in the road outside Aske's boys Grammar school, at the top of the hill. Is that old post still there, I wonder?